Maruti Suzuki has added more equipment to the hot selling Celerio hatchback. Dubbed the VXi+ variant, the Celerio with the additional equipment is a limited edition model. 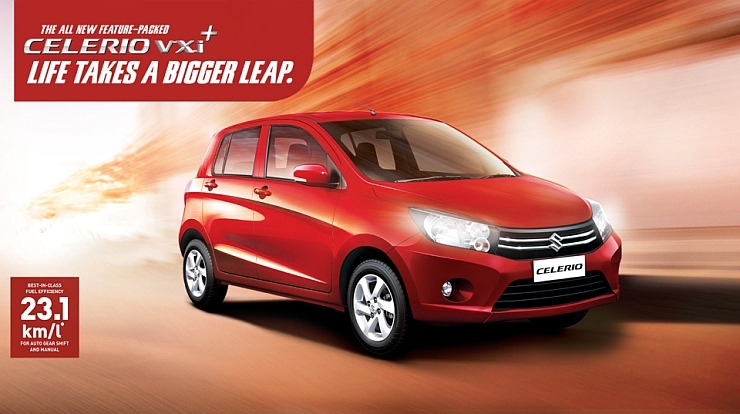 In other words, the Celerio VXi+ will be sold by Maruti Suzuki until stocks last. Maruti Suzuki is offering the accessory bundle of the Celerio VXi+ for a price of 14,000 rupees, which is about 6,000 lower than the market value of these accessories. The lower price tag for the accessory pack is aimed at the festive season car buyers. The Celerio VXi+ MT is priced at 4.20 lakh rupees and 4.58 lakh rupees respectively, ex-showroom Delhi. The Celerio is sold with petrol and CNG engine options. Both fuel options use a 1 liter-3 cylinder K-Series motor that makes 67 Bhp and 90 Nm on petrol. The CNG-Petrol dual fuel option loses some power and torque in the interest of lower running costs. The engine gets a five speed manual transmission as standard fare. Petrol variants of the car can also be specified with an automated manual transmission (AMT). Maruti Suzuki has refrained from offering the AMT option on the CNG powered Celerio as doing so would push up costs by quite a bit. The Celerio AMT is the first car in India that used an automatic manual transmission. A big success for Maruti Suzuki, the Celerio AMT has prompted the automaker to add the AMT option to more budget hatchbacks. The next major AMT car launch from Maruti Suzuki is that of the Alto K10 Facelift. The Alto K10 Facelift with an AMT option, will be launched in the next few weeks. Also coming up next year is an AMT variant of the WagonR Tall-Boy hatchback. In future, expect many more Maruti Suzuki budget hatchbacks to gain AMT options.